If you live in the middle of Ipswich as I do, then no doubt you like to go to Orford. It's barely an hour away by train and bike, quicker by car, and it is like stepping back out of the 21st century. 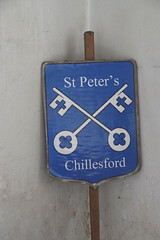 A benefit of going by car is that you pass through Chillesford, the church of St Peter above the road. 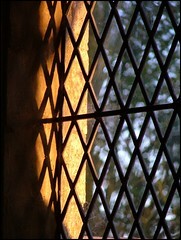 In the late afternoon sun its tower glows with a rich honey colour as you head home. It isn't radiation from the nearby Sizewell reactor, it is coralline crag. There are only two churches in the whole of England that have towers built out of coralline crag, and Chillesford's is one of them. St John the Baptist at Wantisden, less than a mile away, is the other, but the quarry that the crag might have come from is here, behind the church. The height of the church above the road is accentuated by the way the graveyard drops away suddenly towards what is now a roadside pond. Close up, the cragstone is reddish, with the fossils of tiny sea creatures in it. 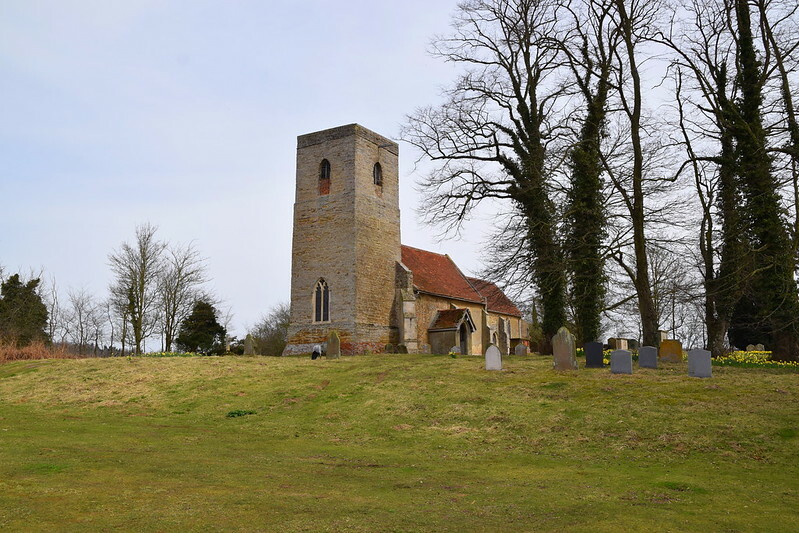 Several coralline crag quarries survive around here, including one close to Ramsholt church, and it can be seen in the ancient church walls at Butley and Sutton. It lends buildings a sturdy, primitive quality, quite unlike delicate but run-of-the-mill Suffolk flintwork. As I say, Chillesford sits on the road to Orford, and so this church is quite well-known. But I wonder how many passers-by bother to climb the track to the top? The visitors book suggests that there aren't many, which is a pity. This quiet little church is as friendly as they come, as you'll be able to tell from the sign on the roadside. Welcome! it says, the church is always open! 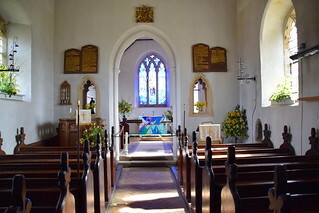 At neighbouring Wantisden, the church is remote and lonely enough to have retained an ancient interior as well, but Chillesford has been thoroughly renewed inside over the centuries. You step into a space full of light and colour, a typical 19th century country church, even smaller than it appears from the outside. I love small country churches which are essentially Victorian inside, perhaps because they are easy to grasp, and give us a sense of the people who made them this way. They are places we can understand, for of course the world we live in today was forged in the 19th century. The most striking feature of St Peter is the east window, which dates from 1990. It was installed after an unfortunate incident when an unhappy young man took an axe to Christopher Gibbs's 1860s Gospel scenes. The lovely replacement glass is by Mellis-based artist Surinder Warboys, perhaps the best of her work, depicting a risen Christ ascending above meadows and fields like those of East Suffolk. 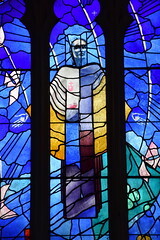 Part of the tracery from the Gibbs window has been reset in a nave window, but otherwise the one surviving 19th Century window is to the west, Edward Frampton's depiction of Christ walking on the waters while the incredulous disciples look on in wonder and fear. Standing at the back of the narrow nave looking east, you see one of the narrowest chancel arches in Suffolk. 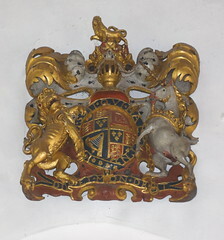 Above it sits a small, carved Stuart royal arms. Looking at the narrow arch beneath, you can see clearly that, historically, chancels and naves started out as essentially separate constructions. The east end of the nave is actually a wall with an opening to divide them. Back in the early centuries of the Church, church buildings were little more than covered altars, but it wasn't long before the gathering people were building their naves as a shelter for themselves as they witnessed the sacrifice of the mass. Over the centuries, these buildings were completely renewed and rebuilt, until, in most cases, they became unified. 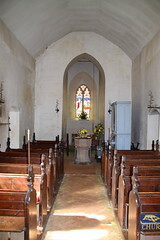 But here, the chancel is still what is known as a 'weeping' chancel, which is to say that it is not directly in line with the nave, but at an angle. Perhaps this is because lining them up exactly was not a great priority for the early-medieval Church. 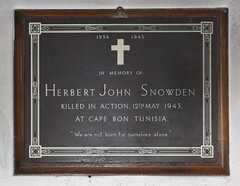 More likely, there wasn't the skill or technology to do so. Over the centuries, successive rebuildings have not corrected the error, and so here they remain, evidence of the distant past, despite the 19th century restoration, and despite how energetic the Victorians were here. There are some large squints either side of the chancel arch, found elsewhere in Suffolk only at Wantisden, Gedding and Chevington with similarly narrow chancel arches. But one glance tells you that they are new, dating from the 1860s. Mortlock thought that these squints might be renewals, replacing squints that already existed. This is certainly possible, especially with such a narrow chancel arch. But they might just as easily be modelled on those up the lane at Wantisden. 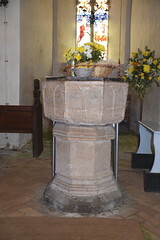 There is a gorgeous medieval piscina in the south nave wall, still retaining much of its original colour. On the wall beside the vestry door is a floor brass, which presumably sat in the chancel floor before the 1860s. 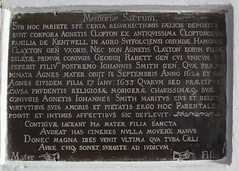 It tells us in Latin that, beneath it, lies Agnes Clopton of the ancient family of Cloptons of Kentwell in the County of Suffolk, along with her daughter. Hands at the bottom point to where mother and daughter lay.